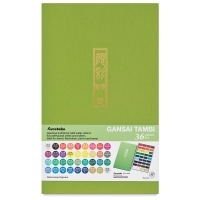 Kuretake Gansai Tambi Watercolors are handcrafted, professional-quality Japanese watercolors with a highly blendable, creamy-smooth consistency. The colors are rich and intense, and exhibit greater opacity than European or American watercolors in traditional Japanese style. 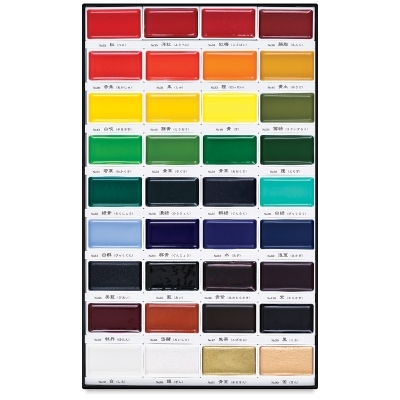 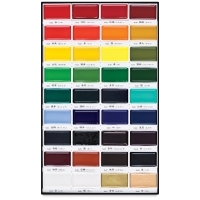 This set contains White, Black, Cadmium Red, Scarlet Red, Red, Orange, Dark Pink, Carmine Red, Wine Red, Deep Pink, Deep Violet, Purple, Lemon Yellow, Bright Yellow, Mid-Yellow, Light Brown, Brown, Dark Brown, Pale Aqua, May Green, Ocean Green, Mid-Green, Olive Green, Green, Marine Green, Turquoise Green, Evergreen, Cornflower Blue, Cobalt Blue, Persian Blue, Blue, Menthol Violet, Deep Blue, Gold, Blush Gold, and Silver.